Cable length meters provide an easy and accurate means of determining cable length measurements. Our top pick is the the Klein Tools VDV501-089 VDV cable distance meter. This Klein Tools distance meter discovers the length of a particular cable by assessing the total capacitance of the cable attached to the unit and then comparing that to a preset or user-defined capacitance per foot variable. 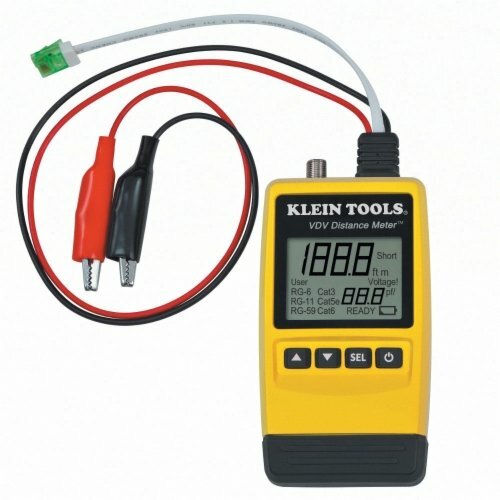 The Klein Tools Distance Meter ships with two alligator clip leads, an RJ-style twisted pair plug and a coaxial F-connector jack to provide input into the unit. It arrives pre-programmed for extra convenience, with nominal length constants for the following cables: RG-6 coaxial, RG-59 coaxial, RG-11 coaxial, Cat6 twisted pair, Cat3 twisted pair, and Cat5e twisted pair. This distance meter is able to figure out if a cable run is damaged or broken, provides a 2.25" LCD display, has an auto-power off functionality as well as a low-battery indication warning system. When in 'user mode', you'll be able to adjust the capacitance/foot constant depending on the cable you are testing. Its manufacturer says that it can automatically detect cable with up to 1,500 feet with + or - 5% accuracy and + or -1 foot. In addition, this cable management device is able to assess cable that is in a box or on a wheel. Buyers that we spoke to say that he used it to measure connected speaker wire lengths that run into a wall. Another buyer that we interviewed told us that it doesn't provide you individual lengths- essentially zero functionality on a single wire because it needs to have one running next to it. This was frustrating for this particular home audio service professional. Let's take a look at 5 of the best-selling cable distance meters on the market today and see how they compare. This cable measuring meter offered by UEi is accurate, reliable, efficient and easy-to-use. Users love the compact design, but some do note that it’s expensive. With a size of 3.8″ x 9.8″ x 13.8″, this cable length meter has a built-in temperature compensator, milliohm measurement capability, an auto power off feature and it can measure the length of copper and aluminum cables. This wire testing tool also reads in meters and feet, and it covers the major wire sizes from 26 gauge to 4/0 gauge. Moreover, the package includes test leads, calibration bar, carrying case and a 9-v battery. A customer shares that he uses this cable length tester almost every day to determine a cable’s length and that it’s very accurate and useful. The reviewer also states that it’s easy to use the UEi cable meter – you just have to attach the clip to both ends of the wire. Another user mentions that he would recommend this portable cable meter to anyone who needs a reliable wire length meter. A happy purchaser also comments that he was very surprised by the quality of the UEi cable length meter and that it’s an excellent choice for anyone who regularly needs to measure cables’ lengths. However, a customer has complained that this cable meter doesn’t measure 1 or 3 AWG wires and that he couldn’t even use it to measure larger wire gauges. This cable length distance meter is inexpensive, well-constructed and practical. Users love the sturdy construction and the price, but some do note that there is no manual. This portable cable tester has a size of 4.9“ x 2.7“ x 1.2“, a 2.25-inch LCD display, an auto power off feature, a low battery indicator, a voltage icon and it’s pre-programmed for common coaxial and twisted pair cables, but you can also manually adjust the capacitance/foot constant. You can use it not only to measure the wire’s length (up to 1.500 feet) but also to determine if the tested cable is broken or damage. In general, users have a favorable opinion of the Klein distance meter, and they praise its performance and design. A buyer shares that this cable tester works far better than he ever expected and that it’s perfect for anyone that needs a cheap cable measuring tester. Another customer comments that the Klein cable length meter is well-built, easy to use and it’s easy to adjust the capacitance. A satisfied purchaser shares that he is happy with this distance meter, even though it doesn’t work as he expected. However, some customers have complained that it won’t measure a single-stranded wire and won’t give individual lengths. Some also state that it doesn’t measure the length of pair and coax cables accurately and that they don’t like that they have to choose the type of wire every time. This cable length tester meter offered by Dbpower is easy-to-use, practical and reliable. Users love the open and short circuit calculation feature, but some do note that the BNC and RJ11 converters are sold separately. 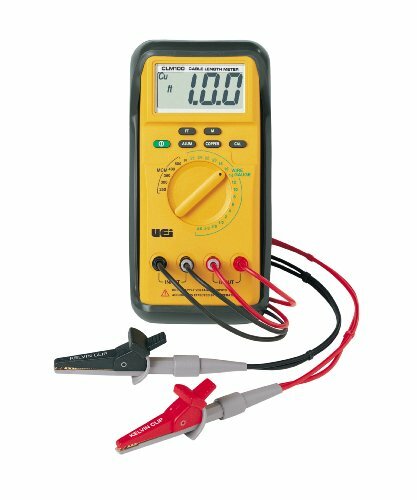 This gray cable length meter has a size of 10.4″ x 9.1″ x 2.4″, an easy-to-read display with backlit and you can use it to conduct a cable connectivity test, and check wiring errors in E5, E6, coaxial cable and telephone line. 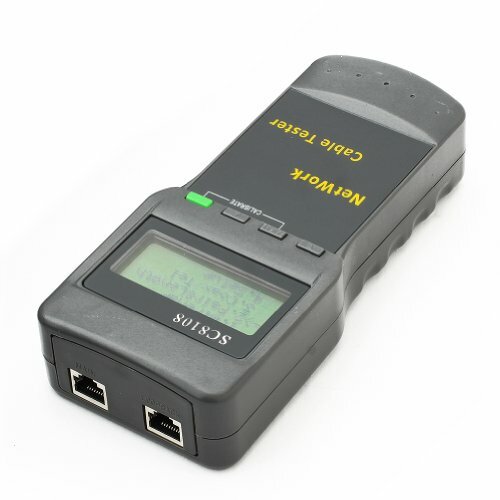 Moreover, this cable tester can indicate the location of the connection error and measure the length of the wire, so this could be useful for any electrician. A user comments that this cable testing tool has easy-to-follow directions and that it works accurately and reliably. The reviewer also states that it’s perfect for CAT5 cable installation and the fact that he can measure the cable length is a real bonus because he can charge his clients accordingly. Another happy user mentions that this is the best cable tester available and it’s perfect for determining Cat5/6 cables continuity and lengths. The purchaser also states that this tester is simple, compact and great for detecting cable failure. However, some customers have complained that the cable tester has a cheap plastic design and would not survive a fall. Some users also complain that the instruction manual is useless and that the tester has to be recalibrated every time if you want it to read in feet instead of meters. This network cable testing tool offered by Pyle Meters is handy, accurate and well-made. Users love the price and the design, but some do note that the adapters for the Rj11, telephone lines, and coaxial cables are not included. This cable length measurer has a size of 2.2 x 10.8 x 8.8 inches, a weight of 5.2 ounces, an easy-to-read display and you can use it to test both shield and unshielded cables via an Rj45 port. This cable tester tool also detects open and short circuits and mismatched wiring, and you can determine the length of the cable with 97% accuracy. Users have a favorable opinion of the Pyle network cable tester, and they praise its functionality, usefulness, and accuracy. A buyer mentions that he uses this cable measuring tester on low-voltage wiring and it works flawlessly. The reviewer states that he is very pleased with his purchase and the display shows everything in an easy-to-understand way. Another user comments that this cable testing tool helped him determined problems with his rj-45 cable after he had installed 6 feet of cable in his house. The user also shares he has only one complaint – the device is too big. Some other customers have complained that this the plastic construction feels cheap and probably won’t survive a fall. This improved network length cable meter offered by Lemonbest is effective, reliable and efficient. Users love that the price, but some do note that it’s cheaply made. This gray network cable length meter has a size of 7.9″ x 5.4″ x 1.9″, auto time power off, one far-end passive test jack and a big LCD screen. 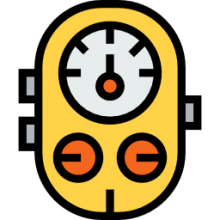 You can use this tester to check pair integrity and continuity of the cable, measure its length, locate the connection error, and determine the distance of the open and the short circuit. It also automatically detects far-end matcher and local port cable and shows if there is a problem. 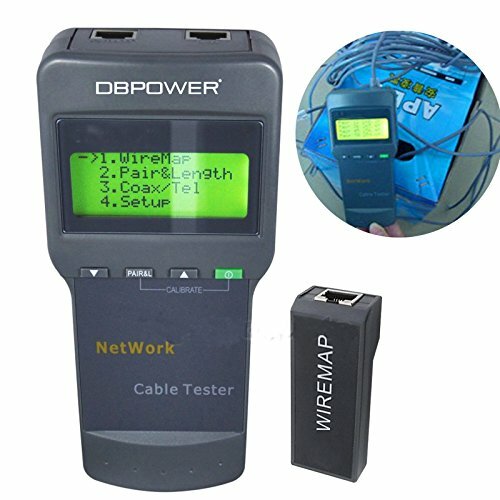 As a whole, users are pleased with the performance and reliability of this network cable tester. A buyer comments that he doesn’t use this cable meter tester regularly, but when he does – it works flawlessly and that it’s an excellent choice for anyone that wants a basic cable tester. Another user commented that he was surprised by the functionality and quality of this cable testing meter and that not only it detected an open circuit, but told him exactly where it was. The reviewer states that he would recommend it to anyone looking for an efficient cable testing tool. A happy purchaser mentions that he loves the compact size and that the tester is very good at detecting faulty wires. However, some customers have complained that the tester doesn’t measure cable length accurately. Some also complain that the network cable tester arrived broken or that the wire map didn’t work. Cable length meters enable the accurate and easy ability to perform cable length measurements. One of our favorite cable length meters is the UEi Instruments CLM100. It is equipped to measure aluminum and copper cables, as well as covering major wire-gauges. We manufacturers say that it will measure 15 to 30,000 feet, wire sizes of 26-Ga to 4/0 Ga. All you need to do to get up and running with this cable length meter is to attach the kelvin clips to both ends of the cable, make sure to choose aluminum or copper cables as well as the wire gauge in order to measure the length. To ensure an accurate reading, the UEi Test Instruments meter calculates the temperature of the wire with its built-in temperature compensation circuit. When you purchase this cable length meter it ships with test leads, a calibration bar, a hard carrying case and a 9 V battery. Its manufacturers also say that this unit is a solid option for distributors and contractors because if its capacity to measure cable that is on a spool or that has already been installed. There was some mixed feedback for this particular cable length meter- with one buyer telling us that it saved him a ton of time and money using it daily on his job site. In particular, it gave him great peace of mind being able to understand whether a cable would be long enough to make it run or not- and he advises that you can just subtract 3% off to ensure that it will fit. Another option we examined was the DBPOWER SC8108 cable testing meter. Its manufacturers say that it provides accurate error location, the ability to measure cable length and detect the precise location of a short circuit or open circuit, all displayed on a large LCD backlit display. One buyer that we spoke with endorsed this cable length tester, saying its pretty simple to use and surprisingly versatile- while also saying the directions were pretty thorough. For one home service professional, being able to detect the exact cable length enables him to accurately charge his customers for the amount that he used in an installation. This, he told us, was crucial to anyone who professionally installs CAT5 cable as a professional service. Another buyer was impressed with the wire map, saying that its near-end/4-end identification, pair-length function was excellent, especially for the price he got it. Though he says that it is not a super high-quality product, it's a functional device that saves a ton of time when a troubleshooting different wiring issues. Indeed, another reviewer that we spoke with told us that he was unimpressed by the plastic construction of the unit- saying that the plastic casing was so incredibly thin that he actually ordered a hard plastic protective case for it. Without that protective case, he says that in his opinion the device would certainly break if dropped from a few feet. Because of this, he told us that he would not recommend this for field use, but in home work situations you could probably get by with it. Other buyers that we spoke with echo this general sentiment, saying that it is poorly constructed, not a durable and long-term option, but the price that they purchased it for was so low in comparison to the outsized functionality it provides, that overall they were happy with having bought it. The Pyle Meters PHCT70 network cable tester was another option we examined- its manufacturers say that they can test both unshielded (UTP) and shield (FTP) cables through its Rj45 port. As well, it has the ability to test RJ 11, coaxial cables and telephone lines by using special adapters that are not included. Its manufacturers claim that it will determine the length of individual strands in pair and length mode with about 97% accuracy. One buyer we spoke with said that it is a handy device, enabling him to troubleshoot cables in his home after he terminated them. Overall, he was pretty impressed with the product, but he said that the interface needed some work to make it easier to use and it was a little bit too big, in his opinion. These cable tester meters enable you to assess cable continuity and sequencing- providing pair integrity analysis of cables as well as measuring the length and pair even with or without a far-end recognizer.